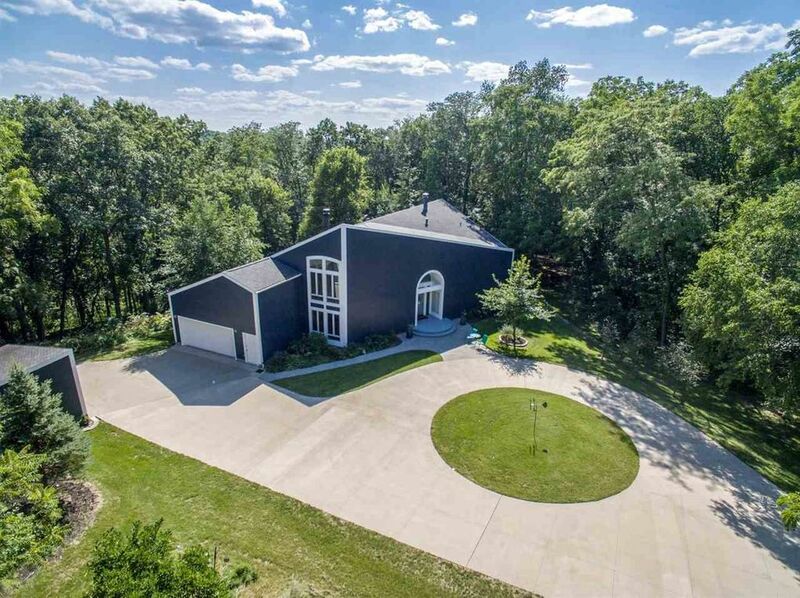 One of a kind 2 story home that commands attention with its timeless style and situated at the end of a cul de sac in the desirable Fjords Subdivision on over 5 acres adjacent to Army Corps of Engineers land with your own nature wildlife preserve! Explore over 4600 sq. ft. and walk some trails with one that leads to the Coralville Lake. There is a spacious kitchen that boasts granite countertops including a raised breakfast bar, premium wood cabinetry, built-in desk, pantry, large dinette and professional grade appliances including double wall ovens and a separate gas cooktop; elegant formal dining; beautiful wood and Spanish tile flooring; convenient first floor study; living room and a cozy first floor family room each highlighted with a wood burning stove; 2 staircases including a designer spiral staircase; white painted trim and solid doors; tremendous Pella window package and 8 ft. Andersen patio doors for loads of natural light throughout; master suite featuring a luxurious tile bath room including a Mosaic glass tile wall, granite sinks, all tile shower and large walk-in closet; 2nd floor loft with unbelievable views; convenient 2nd floor laundry room and adjacent 14x15 storage room; versatile walkout lower level with a rec room, theater room equipped with a projection screen theater system, 4th bedroom and a flex/media room; 592 sq. ft. wrap around deck and stone patio; cement board exterior on all sides; circle drive; stamped concrete; 2 car heated garage with built-in cabinets plus a 12x16 storage shed that matches the house; high efficient Amana HVAC system; nicely landscaped; strong neighborhood/community association and a nice list of improvements over recent years. Make a visit and plan to stay for a while!